Free shipping over RM 175 purchase. 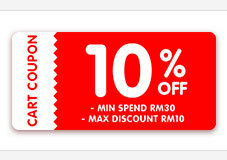 Shipping fee is free when purchasing above RM 175 in a cart. Very bad of delivery service as I had received it by opened and reseal back ... too long shipping period and not update shipping records at shipping company website. Still have some early orders not yet receive. thanks seller color is good. One piece quality ok, another piece quality not ok.
Parcel lost with msia courier service but seller willing to bear responsible for this mistake n resend to me..the most important is seller feedback to buyer immediately, tis service is much much better than other sellersss..
Rcv item in good condition.